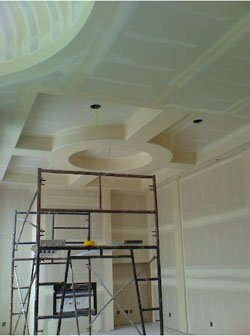 Kemper Drywall has over 30 years of experience in the Oregon and SW Washington market. If your project is large or small, our staff is trained to handle any type of job. Our company has completed thousands of new homes and remodels in the Portland and Vancouver area, as well as many large apartment complexes. Our trained patch and repair crews can assist you with any type of drywall repair. Many builders, remodel contractors, and restoration contractors choose us for our ability to handle any type drywall construction they encounter. We offer insulation. Many of our builders and homeowners prefer using one contractor for drywall and insulation. We save them time and money, they only having one company to call! We also have many journeyman metal stud framers. We have completed many complex commercial tenant improvements that required a high level of finish. We can install any type of acoustical ceiling tile. Whether it is glue up, staple on, or traditional lay in tile, we have the crews with the knowledge to handle any type of application.